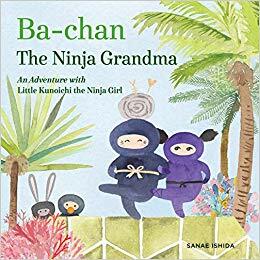 In this new edition to the Little Kunoichi series, author and illustrator Sanae Ishida introduces us to Ba-chan, Little Kunoichi’s wise, creative, and eccentric grandmother. Anything is possible with Ba-chan! It’s summer and Little Kunoichi’s friends are away on vacation. After exploring every nook and cranny of her super, super secret island home with her pet, Bunny, she is bored, bored, BORED! Little Kunoichi shares her ideas to spice things up–a new bike, another pet–with her parents. But they have a better idea: a visit to her wise, quirky, and creative grandma, Ba-chan!